Many people believe that healthy and easy can’t be in the same sentence. Why does healthy need to be paired with words like time consuming and complicated? It’s like when someone says healthy we all imagine chopping, prepping and washing veggies for hours on end. Here’s to putting an end to those thoughts and to making healthy easy, fun and SIMPLE! While there is a little bit of planning to go into eating healthier, but it will make your life so much more enjoyable if you can grab a healthy snack instead of sneaking to the closest vending machine. I’ve put together some simple steps that can help us all avoid our cravings for those tempting packaged and processed goods. Let’s find 15 minutes in our busy schedules to make a giant batch of a high-energy, healthy treat that we can use as a grab and go. A granola with some nuts, seeds and a dried fruit is perfect to keep you going throughout the day. Peanut butter granola with pumpkin seeds, flax seeds, almonds, and dried cherries. Sandwiches, wraps, pitas!! Start off with a wholesome bread like Ezekiel bread, whole grain or a whole wheat pita and then fill it up. I loved to spread some hummus or avocado on mine and then stack it up with veggies. Some veggies that are great are tomatoes, spinach, cucumber, sprouts, avocado and some carrots for a crunch. Another tasty and healthy addition are slices or roasted beets. The world is your oyster when it comes to building a delicious sandwich, wrap, or pita. If you want to ditch the bread try using collard greens and roll as if you were preparing a wrap. Get creative and think seasonal. If the weather is nice, head to your local farmers market for some local, organic veggies to get the optimal health benefits. What is simpler than packing a ton of vitamins and minerals into one? A smoothie! Throw all your seasonal fruits, veggies, a splash of almond milk, into one blender, give it a swirl and BAMB! You have a healthy cool treat that will send those candy cravings out the door. Quick and simple. Healthy and salads go hand in hand, but salads can be easy too. There is no cooking with salads! You’re salad can have all your favorite ingredients in it and can be an on the go item. Throw it in a bowl and slap a lid on that baby and you’re out the door without any regrets or wondering what’s in store for lunch. 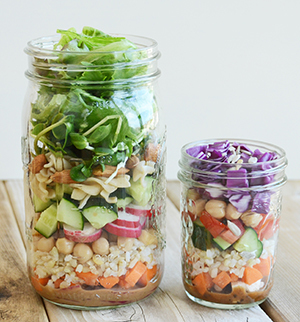 Another idea is layering your ingredients in a jar- putting the dressing in first so Keeps nuts, beans and lentils on hand. They are an easy additive with what you’re making. What takes two 2-3 minutes and is just about the best source of protein you can find? The egg! Eggs can be a part of any and every meal. You can scramble them up with some sautéed veggies, you can put it in salads, throw it in a sandy. Eggs can make your meal that much more nutritious and will fill you up. If you can, buy pastured eggs from your local farmer. If not, look for organic, avoiding antibiotics. Cooking in large batches will help us from scavenging through the pantry then end up with chips and salsa on the couch. Making a healthy stir-fry, salad, or salad in bulk can be saved in your fridge and brought out on a day where you just don’t feel like spending any time in the kitchen. Have breakfast items that you can grab on the go. Yogurts, fruit, granola are all great things to have at all times so you we 1) don’t skip breakfast, then over eat at lunch or 2) end up going to the closest drive through for a breakfast sandwich or seeing donuts at the office and diving in. Keeping fruit on hand will fulfill our sweet cravings. Apples and peanut butter, handful of strawberries, and blueberries and yogurt are a perfect fit. Frozen veggies and frozen fruit can come in handy when we are in a pinch. Keep them on the back burner when you don’t have any produce. Just keep an eye out for sodium levels and added sugars. 1) Heat the oven to 300°F and arrange a rack in the middle. 2) Place the honey, oil, and vanilla in a small bowl and stir to combine. Pour over the oat mixture and mix until the oats are thoroughly coated. 3) Spread the mixture in a thin, even layer on a rimmed baking sheet. Bake for 15 minutes, then stir and continue baking until the granola is very light golden brown, about 5 to 15 minutes more. 5) Add the fruit and nuts or seeds to the baking sheet and toss to combine. 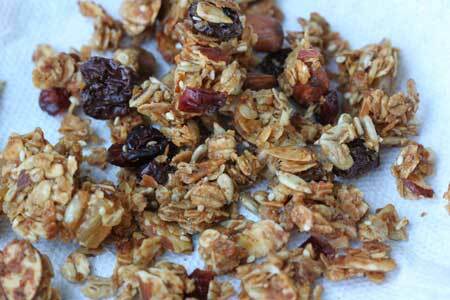 Store the granola in an airtight container for up to 2 weeks. What’s better on a cold winter day (or any day really) than a delicious, comforting piece of banana bread? Since it is one of my all time favorite treats and I have been craving it a lot this winter, I have been been making healthier versions by using whole wheat flour, a touch of maple syrup, adding ground flax seeds and walnuts for extra omega 3s. Feel free to add some dark chocolate or cacao nibs for extra flavor and health benefits such as antioxidants, lowering blood sugar and boosting moods. Preheat oven to 350F and grease a loaf pan with coconut oil or butter or line with parchment paper. In a large mixing bowl, mash the bananas and add the melted coconut oil or butter. Stir in any additional ingredients like chocolate chips and walnuts. To make this recipe vegan, swap the egg for a flax egg (soak 1 TBS of ground flax in 3 TBS water for 15 mins) or your favorite egg replacer. I have been making a lot of different variations off of the above recipe. Feel free to add any of your favorite dried fruits, nuts, seeds or even swap out the flour for gluten-free variety and add 1/4 tsp xanthan gum. These three recipes are a must try! They help to replenish and repair after a workout, boost your immune system and taste delicious. They are also packed with essential vitamins and nutrients like fiber, healthy fats, B vitamins, and much more. If you’re like me, these will quickly become smoothie recipe staples. Enjoy! 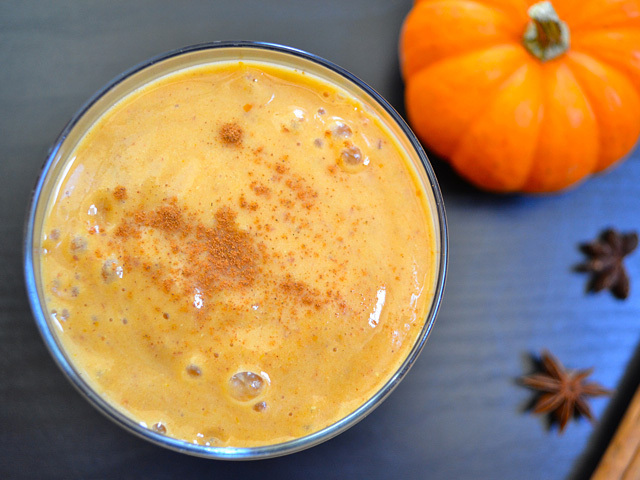 Pumpkin is loaded with vitamin A, which protects against the cell damage that occurs during exercise. Avocados are high in monounsaturated fat—specifically oleic acid—which is been linked to reduction in inflammation. Gingerols, compounds in ginger root, act as potent anti-inflammatories that speed your recovery time. Meanwhile, fiber-rich flaxseed satisfies hunger, so you’re less likely to find your stomach rumbling later in the day. Greek yogurt provides the protein necessary for repairing and rebuilding muscle tissue, and the banana replaces the carbohydrates and potassium lost during exercise. Molasses is a good source of iron that aids in the delivery of oxygen to muscles.